Mobile phones have become ubiquitous and are proving to be a one stop shop for fulfilling a host of user needs and wants. Not only is mobile adoption increasing, even the time spent on mobile phones is witnessing an upward swing. According to KPCB’s, Internet Trends 2015, mobile digital media time in the US stands at 51% compared to desktop at 42%. Thus, mobile phones have created a real opportunity for brands to effectively connect with customers. Businesses and brands are constantly looking for innovative ways to engage customers on their mobile phones and mobile strategies are becoming a mainstay in marketing strategies across companies. In fact, having a good mobile strategy is now critical to brand loyalty, revenues and overall business success. In this post we discuss some unique approaches that businesses can take advantage of in order to increase customer engagement on mobile phones. With a plethora of apps and mobile solutions crowding the market today, it is important that businesses not only focus on content but also the platform through which the content is channeled to customers. In order to grow customer engagement on mobile phones, brands should collaborate with other popular mobile channels (or apps) that enjoy high customer adoption. An interesting example of this can be seen with the leading music discovery app, Shazam. Shazam, as part of its brand specific advertising initiative, ‘Shazam for Brands’, uses accumulated user data and brand advertisements in order to pick out artists and musical genres for brands in order to create specific and customized ad units to drive customer engagement. Brands should leverage such popular platforms in order to connect with customers in interesting and engaging ways. Another great way to reach customers is by leveraging Eddystone beacons and the Google Chrome App on mobiles. Google also recently announced that its Chrome browser has crossed 1 billion active monthly users, making it an excellent channel to precisely connect with customers straight through the Google Chrome app on their mobile phones. In case you are planning to use beacons for your business, here is a helpful article on how to plan and execute an Eddystone beacon campaign from scratch. Such initiatives are also a great way to build a brand’s reputation on social media platforms. In fact, this concept is known as ‘Social Wi-Fi’ and benefits both customers and businesses. Some businesses also leverage this platform to gather customer insights by asking customers to fill out customer survey forms in return for free Wi-Fi. In order to promote such free Wi-Fi services, brands should leverage offline marketing techniques like signages , radio advertisements etc. to ensure that customers are aware of such services. Location-based interactions on mobile phones are fast gaining momentum with 9 out of 10 users in the US alone using location services on their mobile phones, according to data from Pew Research Center. Given the growing importance of location intelligence, brands should leverage innovative technologies like iBeacon in order to send location specific, contextual and data-driven content to customers on their mobile phones at the right time. Such location-based content is also popular among customers. In an interesting survey conducted by Aimia and Columbia Business School, nearly 69% agreed that they would share location data in order to receive location-based discounts. 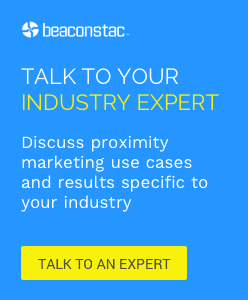 Beacons can be leveraged to not only push location-based offers and promotions, but for other location-based initiatives like loyalty programs and mobile-based proximity payments as well. All such initiatives lead to further accelerating a brand’s mobile presence. In an interesting example, a large Irish department store leveraged beacons (and geofencing) to increase their brand’s engagement rates on mobile channels as well as in-store. This targeted data-driven campaign led to 72% unique CTR (click through rates) on beacon notifications received by customers. Thus, beacon-based location marketing is a great way to boost customer engagement on mobile phones. The use of mobile phones today has far surpassed basic actions (like making phone calls/ sending messages etc). Users are constantly using their mobile phones for a host of reasons from engaging on social media to reading online product/service reviews to redeeming mobile coupons. Taking advantage of this behaviour, businesses are proactively engaging with customers on their mobile phones. However, to make such engagement actually convert to revenues, businesses should ensure that they provide customers with purchasing and payment channels directly on mobile phones. Mobile messages should be tailored in such a way that it encourages customers to move closer down the purchasing path. Allowing customers to make mobile payments, saving products to a wishlist/cart on a mobile app and social media ‘buy buttons’ are a few ways to deliver purchase driven mobile engagement. An interesting example of mobile payments was seen at the recently held music and arts festival, Coachella 2016. The festival leveraged beacons to not only send location-based notifications (about artists and vendors) to attendees, but also offered a mobile-based rewards program called ‘Surprise and Delight’ that rewarded attendees who synced their American Express Cards to the event’s iOS app. In addition to this, Coachella also provided beacon enabled mobile payments to attendees, thus obviating the need for a physical wallet. Mobile-based loyalty programs also provide a great way to increase customer engagement on mobile phones. It is also a good opportunity for brands to revamp traditional loyalty programs (such as loyalty cards, loyalty stamps etc) as it does not sync in with the new age mobile-driven economy. The Starbucks rewards program, ‘My starbucks’ is an excellent example of a mobile-based loyalty program. Customers with the Starbucks app can collect reward points for making regular purchases in the store, as well as for pre-ordering on their mobile phones. The well designed program also allows customers to customize their orders, receive free upgrades and special discounts based on their loyalty status. Adopting mobile-based loyalty programs not only helps increase customer engagement on mobile phones, it also helps in bridging the gap between a brand’s online and physical presence. Thus, businesses and brands should aim at creating valuable and engaging content/services on mobile phones, in order to create a sound online presence and ensure brand loyalty. A key consideration while devising any mobile strategy is to ensure that it aligns with the overall marketing and business goals of the brand. Businesses should also be careful to test various approaches and choose the options that best connect with the target audience. wonderful write up. Thanks! well marketers and advertisers can also boost customer engagement on mobile via the most popular medium, moLotus. It is an innovative rich media mobile video messaging platform that reaches your customer’s inbox directly without any app or the internet. It establishes deeper customer engagement with its personalized and customized audio visual messages.